Dams do so much more than hold back some water. They power cities, create nature preserves, and recreational lakes. They’re peppered across the country and attract millions campers, photographers and fishermen every year. A 47-foot platform viewing tower provides jaw-dropping views of the lake and region, he said. Interested in seeing the tallest dams in the nation? Head to California, where five of the 10 largest are housed. Washington’s Grand Coulee Dam: Spanning nearly a mile, the dam helped create the Lake Roosevelt National Camping Area. Visit between Memorial Day and the end of September to witness nightly laser shows. Michigan’s Redridge Steel Dam: Included on the National Register of Historic Places, this dam features jutting, rusted steel beams creating dramatic angles that coax photographers from all parts of the world. All steel dams are tremendously rare, making Redridge Steel Dam a unique place to visit. Nevada’s Hoover Dam: The iconic dam now features a four-lane bypass bridge completed in 2010. The Mike O'Callaghan – Pat Tillman Memorial Bridge runs parallel to the dam and offers the dam protection against a terrorist attack as well as a quicker route for drivers. Visitors can still walk atop the Hoover Dam, which closed to vehicle traffic in recent years. Stunning valley views immediately come into focus as the mighty Colorado River rolls below. The Hoover Dam stands 726 feet above the river and weighs in at more than 13 trillion pounds. Lake Mead, America’s largest artificial lake, exists because of the dam. California’s Oroville Dam : Besides being the tallest dam in the nation at 770 feet, Oroville includes floating campsites on the lake, a 47-foot viewing platform and free admission. 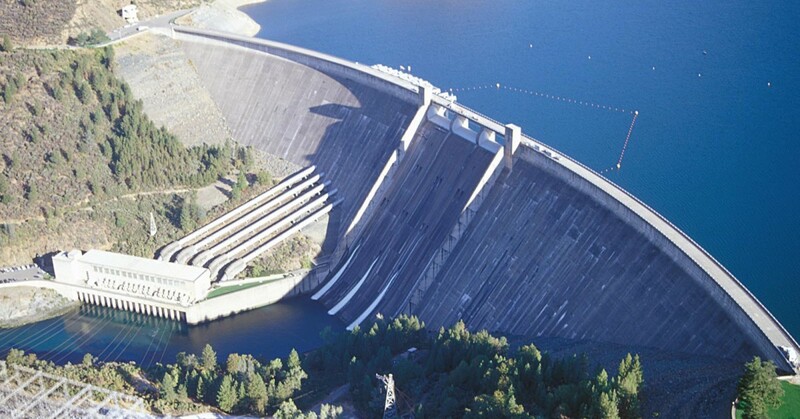 California’s Shasta Dam:This dam serves as a tourist attraction for the Northern California city of Redding. Guided tours, houseboats and cabin rentals are all available to visitors. Arizona’s Glen Canyon Dam: The visitor’s center includes 45-minute guided tours and a walking bridge overlooks the cavernous gorge. The Colorado River’s green and blue hues play perfectly off the canyon’s brick red earth. North Dakota’s Garrison Dam: Set on the Missouri River in central North Dakota, this earth-fill embankment dam stretches nearly 2 miles. The Garrison Dam National Fish Hatchery houses the world’s largest walleye and northern pike production facility. Alabama’s Jordan Dam: Lake Jordan features nearly 200 miles of shoreline and has two public access sites. In 2004, the lake hosted the Bass Master’s Classic. Texas’ Lavon Dam: Lavon Lake, located in the northeastern corner of Texas, offers an excellent fishing hole for largemouth bass, crappie and blue catfish.